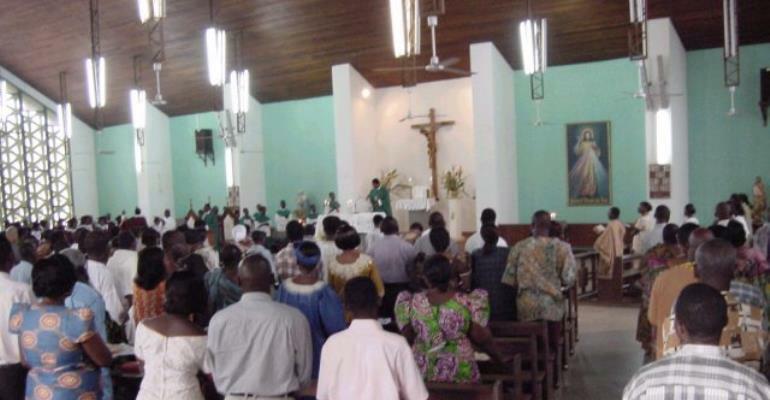 ... Church memers beat her up Accra Jan. 4, GNA - A 22-year-old nursing mother, who was worshipping at the Calvary Presbyterian Church at Chorkor in Accra, for the first time, on Sunday January 2, was beaten up by some angry members of the Church when she stole 180,000 cedis belonging to a woman she occupied the same pew with. Dora stole the money from the bag of one Madam Kate Ankrah and stealthily put it in her brassier when the congregation had lined up for the third offertory. When Madam Ankrah returned to her seat, she discovered that her money was missing. Some members of the Church who saw Dora stealing the money escorted her out of the Church and retrieved the money from her brassier and subjected her to beatings. A member of the congregation, Maame Esi, who invited Dora to the Church, intervened to save her from further beatings.